Director Laurice Guillen wants to veer away from doing heavy drama this year. Award-winning director Laurice Guillen admitted she is looking forward to her newest project for the year Once Upon a Princess, which stars Enchong Dee and Erich Gonzales. The talented director said she is confident it will be easy to work with the two Star Magic artists since she is not totally unfamiliar with them. “I’m excited to work with them. I’ve worked with Enchong before both in a film and a workshop. Tapos si Erich kilala ko na from a workshop before pa pero it’s my first time to work with the two of them together. They have a special chemistry kaya I look forward to working with them sa project na ito. I’ve worked with both of them na sa workshop so they’re familiar with my working style and I’m going to use the same thing and I’m really looking forward to it. Iniisip ko usually pagka may project ka and you’re working with actors for the first time hindi mo alam kung anong magiging samahan ninyo. But with them I anticipate that it’s going to be easy, creative, and very collaborative. Madaming sequences ito pero I’m sure that we can do it fast and it will be fun at the same time,” she said. 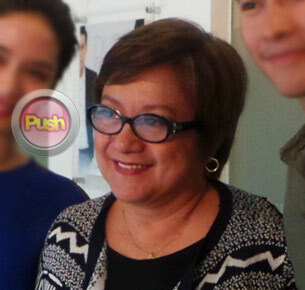 After her last Kapamilya directorial project Sa 'Yo Lamang in 2010, direk Laurice said she did not hesitate when she read the script of Once Upon a Princess. “Gusto ko yung story and gusto ko rin yung casting, gusto ko rin talagang gumawa ng romance drama para hindi naman panay mabigat na drama. I was going to do a film talaga in ABS-CBN but then they asked if I could do this first. Ang una pa ngang sinabi rom-com, sabi ko okay kasi ang tagal ko na ring hindi gumagawa ng pelikula at yung mga huli kong pelikula were really serious dramas so pagbalik ko I wanted to do something different, either romantic drama or even a rom-com. Nung makita ko itong story nito, hindi siya rom-com, romantic drama siya na nakaka-engage, ito yung klase ng romantic novel na binabasa ko rin nung kabataan ko (laughs). Ang maganda dito sa istorya, it starts when they’re young, mga teenager pa, so dun sumibol yung love story nila tapos nahiwalay sila for seven years, parang yung tamabalan din ni Enchong and Erich na nahiwalay din for several years. Dito seven years tapos nagkita sila ulit ng hindi inaasahan. Yung huli nilang pagkikita hindi maganda ang ending eh, eto ngayon nagkita sila uli at kung paano bumalik yung kanilang love for each other. So actually it really is a romantic drama,” she shared. Once Upon a Princess will be shot mostly in different locations in Metro Manila, but will also have scenes in out-of-town locations like Tagaytay and Calatagan, Batangas and is scheduled to be shown in theaters nationwide by the second quarter of 2014 under Skylight Films.